The grocer, which is buying Asda for 7.3 bln pounds, wants UK competition authorities to vet retail mergers in a new way. The rise of discount rivals and online sales means it has a point. A revamp of the metrics used to make sure shoppers have enough choice looks inevitable. Shopping bags from Asda and Sainsbury's are seen in Manchester, Britain April 30, 2018. 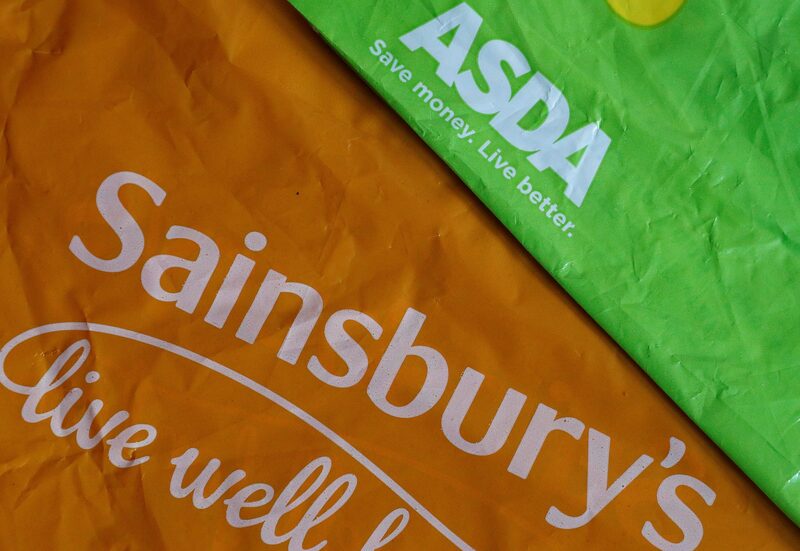 J Sainsbury and Asda, the UK subsidiary of Walmart, on April 30 confirmed that they had agreed a merger to create Britain’s largest supermarket group by market share. The two companies want Britain’s Competition and Markets Authority to fast-track any probe of the deal by going straight to an in-depth “phase two” stage. Together, the two companies would control 27 percent of the UK grocery market, based on Kantar data for 2017. That would top Tesco’s 25 percent market share.